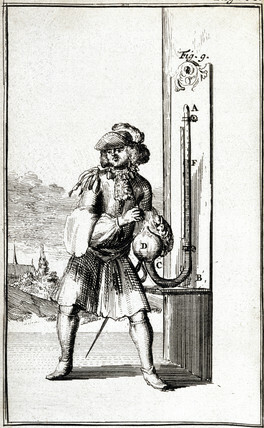 Plate from 'Traittez des Barometres, Thermometres et Notiometres ou Hygrometres' (1688) by J D'Alence. This illustration shows how dampness is indicated by changes in the length of a stretched cord. The book is a pocket-sized treatise on the barometer, thermometer and hygrometer, with 35 plates showing natural philosophers at work and the variety of instruments used by them. The plates are particularly early illustrations of natural philosophers at work.